After a successful first outing back in November, high stakes fans will be pleased to hear that PokerStars will once again be hosting a week long series of big buy-in tournaments online, as their "High Rollers" series is back for a second run and is guaranteeing $10,000,000 in prizepools. 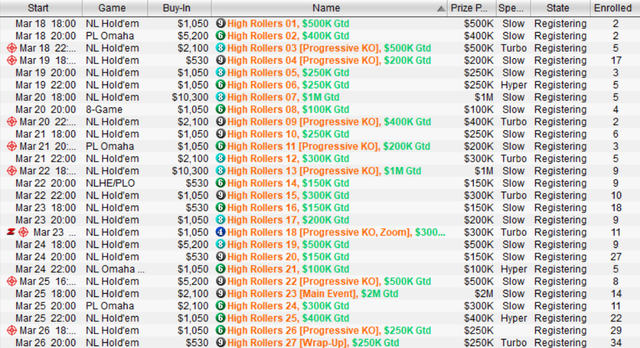 The series kicks off on Sunday March 18th at 18:00 WET with High Roller 1, $1,050 NL $500k GTD and wraps up on Monday 26th March with High Roller 27, $530 NL $250k GTD and also with the conclusion of High Roller 23, $2,100 NL Main Event $2m GTD. As well as NLHE there are three PLO, a NL Omaha H/L, and an 8-game High Roller. Formats include Hyper, Turbo, Progressive KO and Progressive KO Zoom as well as standard structure tournies and buy-ins range from $530 up to $10,300 with guarantees from $100k up to $2m. Last time out the overall guarantee was comfortably beaten, with the series paying out close to $15m.